"Pride and Prejudice lives on" (USA Today) in Lauren Willig's Pink Carnation series, which has been hailed for its addictive blend of history, romance, and adventure. 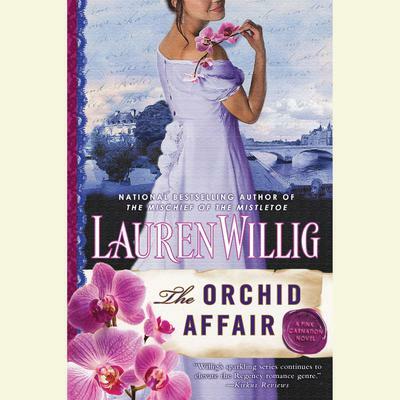 In The Orchid Affair, Willig introduces her strongest heroine yet. Laura Grey, a veteran governess, joins the Selwick Spy School expecting to find elaborate disguises and thrilling exploits in service to the spy known as the Pink Carnation. She hardly expects her first assignment to be serving as governess for the children of Andre Jaouen, right-hand man to Bonaparte's minister of police. Jaouen and his arch rival, Gaston Delaroche, are investigating a suspected Royalist plot to unseat Bonaparte, and Laura's mission is to report any suspicious findings. As their plots begin to unravel, Laura and Jaouen are forced on the run with the children, and with the help of the Pink Carnation they escape to the countryside, traveling as husband and wife. But Delaroche will stop at nothing to take down his nemesis. With his men hot on their trail, can Laura and Jaouen seal the fate of Europe before it's too late?